Proven Winners’ Toucan Rose Canna, shot in my garden in July, 2016. I never thought I’d have a canna in my garden. I thought they were hard to grow, that you needed a special container for them, that planting them in said container was complicated and that you had to put them in a special protected area or they’d die almost immediately. But then last year (2016), Proven Winners sent me one to trial. Specifically they gave me a Toucan™ Rose Canna, scheduled to debut in Canada in 2017. They claimed that their canna was as easy to grow as a petunia. I took them at their word. Guess what? They were right. The results were eye-popping. 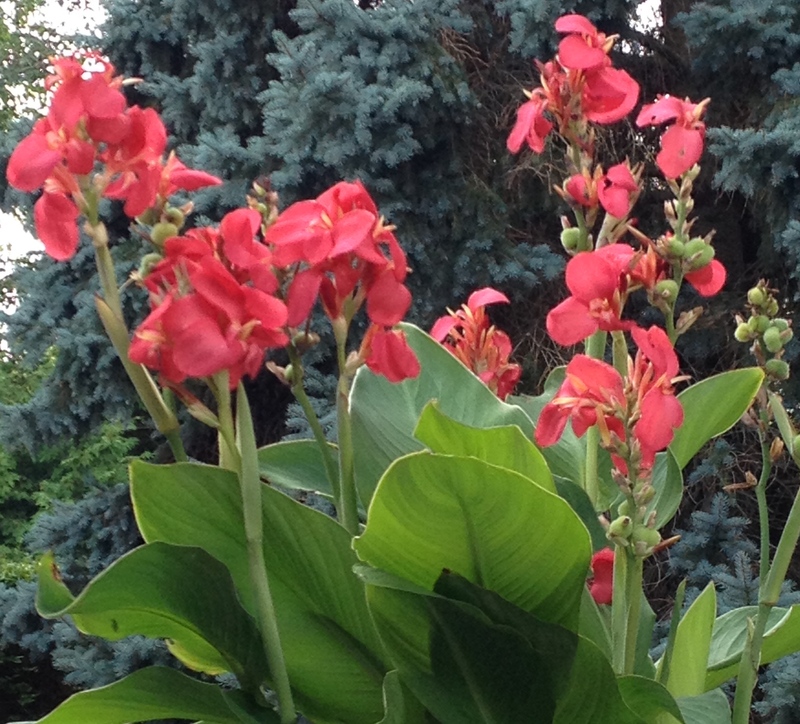 Over the course of the summer, my canna grew long, wide leaves that never flopped and a long succession of blooms in a coral/pink/red that were exactly the colour of lipstick I’ve always wanted and never found. Once the blooms started to fade, the brilliant lime green seedheads were equally captivating. I realized that cannas might just be the ideal patio plant when you’re planning to spend a fair amount of time away from that patio. We spent many a long weekend up at our cottage so I needed containers that could survive hot, humid days in total neglect. Because there’s really no way you can over-water this plant (it’s happy getting the occasional flooding), I’d give the pot a very generous soaking and then come back after four days to a plant that was bigger and brighter than ever. 1. Choose a large container with drainage holes but don’t bother adding a layer of pebbles or stones at the bottom of the container. Soil research has proven that doing this doesn’t help your pot to drain any better. 2. Fill the container with potting soil. Special soil is not needed. I used basic soilless potting mix. 3. Plant the canna rhizome (the rough-skinned tuber) with the eyes (sprouts) pointing up. 4. Cover it with about 4 inches of soil. Water well. Toucan Rose canna flower spikes. • The Toucan™ Rose Canna is one of a collection of four new cannas in the Proven Winners’ Toucan™ collection new for Spring 2017 at garden centres in Canada. The collection also offers Red, Scarlet, and Yellow varieties. All are promoted as virus-free. • Grows quickly in either containers or in a large garden bed. • Grows up to four feet in height and can spread up to 2 feet. • Heat tolerant. This is a great container plant to fill up the hottest corner of a backyard patio. • Requires average to consistent moisture and tolerates occasional flooding/bog conditions. • Ideal for large containers. • Apply controlled release fertilizer once in spring. DON’T DEADHEAD: I have to admit that I think the fuzzy, lime green seed heads, revealed as the petals fell away, are equally arresting. To keep the plant looking fresh, I plucked off the fleshy petals as they started to expire but didn’t cut off the entire flower spike until after the seed heads started to brown up. Cut off leaves as they start to look tired or turn yellow. 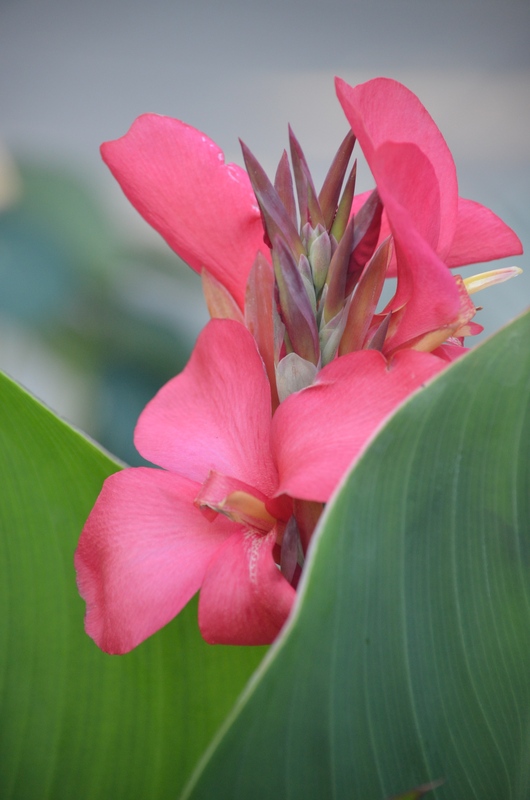 Canna blooms are lush and fleshy. Pull off the petals as they start to expire to keep the plant looking fresh. I think the fuzzy, lime green seed heads that appear after the petals fall off of a Toucan Rose canna bloom are just as captivating as the flower itself. DO MULCH AND MAKE IT FUN: I used blue glass and plastic beads and shiny decorative bits (see below), found at a local crafts supply store, as mulch. I liked how the blues contrasted with the brilliant rose blooms and how the beads, glinting in the sun, mimicked the surface of water. On the practical side, the mulch worked a charm. I would give the plant a good, deep watering (basically flooding the container) and then leave for long weekends at the cottage, always coming back to happy plant, usually sprouting even more blooms. I used blue glass stones and plastic beads as a mulch to help keep the soil in the container moist and cool. I used a variety of blue-coloured glass and plastic decorative beads and stones as a mulch. 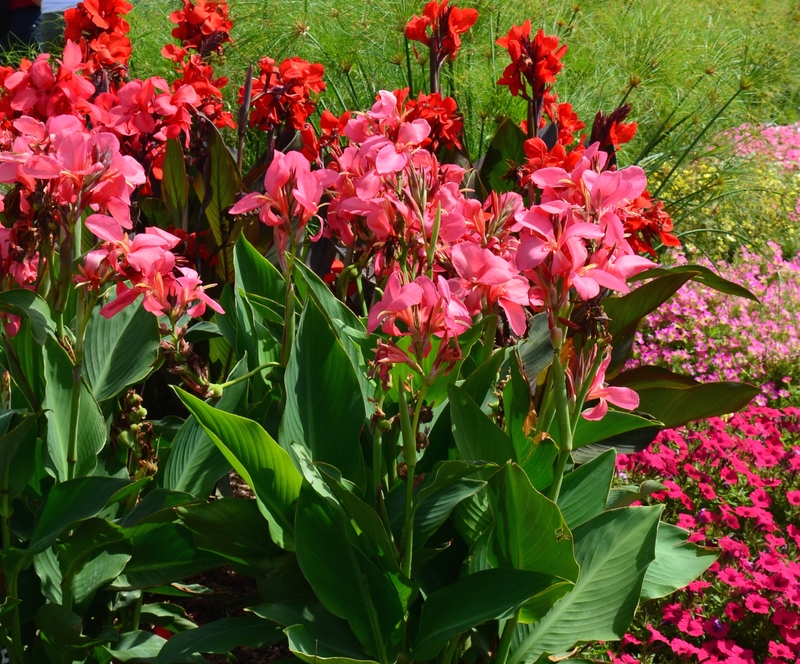 DO GROW A WHOLE BUNCH FOR MAXIMUM LUSHNESS: I chose to plant my canna in a large container but these plants work well in a large border as well. The photo below was shot at the Landscape Ontario trial gardens last summer. A variety of cannas were planted along with Egyptian Papyrus (Cyperus papyrus) (just seen behind the cannas). The trick to nurturing cannas in beds is keeping the soil consistently moist–a thick layer of mulch is a must. Toucan cannas from Proven Winners planted in a deep border at the Landscape Ontario trial gardens, 2016. ← Does your garden really need drought tolerant plants?